LaQueta R. Hatton is the Founder and Executive Director of SOAR II Greatness, Inc. (S2G, Inc), a 501c3 nonprofit organization, Founder and Sustainability Strategist of Rise to Greatness, LLC and a Doctoral candidate at Regent University in Virginia Beach, VA. My desire is to equip and empower leaders of nonprofit organizations with the skills and mindsets for perpetual sustainability. Nonprofit organizations are usually founded on a great platform, research, education, health care, homelessness, hunger, and/or poverty alleviation, just to name a few, and through the creation of resources and services, each are purposed to impact individuals and/or communities (defined as both a group people living in the same place and a group of people having particular characteristics in common) and create positive and sustainable change in the world. While, this grand platform focuses on a problem at hand, many times the purpose is too narrow and lacks the ability to create a long-term substantial effect on the community it serves or the organization as a whole. Failure to properly plan and account for both short- and long-term sustainability creates a deficit in the affects the nonprofit organization has within the community, and upon individuals, which are the purported recipients of the resources, services and programs offered by the nonprofit organization; for when the organization fails and or when there is a lack of funding, an even greater void is created within the community. Founding a nonprofit organization is not for the faint at heart; unlike for-profit businesses/organizations the services, resources, and products are not for sell. The revenue stream is earned through being able to convince individuals, business and organizations (donors) to believe in your ability to make a difference (fundraising). Instead of a paying customer base, resources, programs, and services are given away (to clients) in the hopes that they will create a consumer who will impact their communities for the better. Founding a nonprofit organization is a labor of love, a ‘Higher Power call’ to create a vehicle which will provide for and sustain life while the storms and floods, designed to wash away life as it has been known, destroys the very thing which has kept one anchored. Few will answer this call because the task of creating a new organization, let alone one whose sole focus is on creating ‘something from nothing’ is a daunting and fearful task. This paper is written to encourage, enlighten, and empower those who desire to be Founders of charitable, not-for-profit organizations. This paper is designed to take some of the fear out of the seemingly insurmountable lists of ‘things to do’ and to bring a renewal of energy and vision, and a fresh perspective by offering practical advice through the creation of this hands-on guide. Known as SEOs (Social Entrepreneurial Organizations), TSOs (Third Sector Organizations), and NPOs (nonprofits organizations), nonprofit organizations operate in an increasingly turbulent context where building sustainable organizations has emerged as a critical need. As a result, more nonprofit organizations are aligning themselves with sustainability efforts which will create the greatest good for the social economy. This change has led toward developing innovative practices and strategic responses. Part of the third sector of economy or social economy, the range of organizations that are neither public sector nor private sector and includes voluntary and community organizations, key components of NPOs and the social economy are they generally: are independent of government, are ‘value-driven’ (motivated by the desire to achieve social goals rather than the desire to distribute profit) and reinvest any surpluses generated in the pursuit of their goals. Nonprofit organizations provide goods and services that are not delivered by the businesses within public sectors, develop skills, create employment and foster pathways for social inclusion, dependent upon the assistance of faithful volunteers and donors, concomitantly while alleviating many social ills that plague individuals, communities, and the world. Sustainable leadership undertakes activist engagement with the environment. Sustainable leadership within nonprofit organizations is built upon the platform of these principles: creating and preserving, securing, sustaining, addressing, developing, and activism. In addition to the aforementioned principles, nonprofit organizations must also be vision and results oriented, adaptable to changing conditions, have a broad base of community support, have strong internal systems and be key champions in change. 2016 statistics from The Center for Charitable Statistics, report shows that there are 1,571,056 tax-exempt nonprofit organizations in the USA, 1,097,689 public charities, 105,030 private foundations, 368,337 other types of nonprofit organizations, including chambers of commerce, fraternal organizations and civic leagues, only 2.39% (533,306) of the aforementioned nonprofit organizations account for 90% of total reported revenue over 1 million dollars. Giving USA reported that $373.25 billion was donated to US charitable causes in 2015, with 71% of this total coming from individuals. Sustainability in the nonprofit context includes the concepts of financial sustainability, as well as leadership succession planning, adaptability, and strategic planning. Without nonprofit organizations, the individual and collective goals and needs of communities and causes would be impossible to fulfill. Many nonprofit organizations never reach the necessary scale to have the impact they desire, due in part to the nonprofit sector having too many small organizations that are just getting by, and too few big ones that can really solve problems. In order to create sustainability in nonprofits, strategic planning and implementation from the beginning are vital. 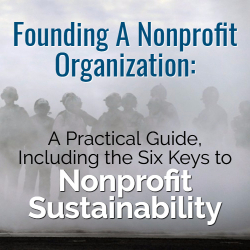 With this in mind, values as organizational culture, community resource mapping, VMOSA, organizational alignment, donors and donation allocations, and web presence are the six keys to nonprofit sustainability. The first and most significant step in creating a nonprofit organization is to know the values that the organization will hold and become your standards of importance. Organizational values serve as criteria for making decisions and setting priorities and lie behind the explanations and justifications [leaders] give for [their] actions; these values become organizational culture. Values are the first key in creating nonprofit sustainability because they are the foundation and when in place they provide viability and authenticity. In this vein, viability refers to being capable of working successfully in a business climate. Indicative of viable values, the values must allow people to use and develop their abilities and make a contribution within an atmosphere conducive to self-respect and acceptance, and authenticity refers to the genuine manner in which values are expressed both verbally and behaviorally. Nonprofit values should articulate human values such as love, kindness, justice, peace, honesty, respect, openness, loyalty, trust, and equality (to name a few), as well as other preferable modes of behavior (instrumental values) and desirable end-states of existence (terminal values). Many times, those values held by the founder create the unique culture of the organization. As such, the values, beliefs, and norms which shape the leader will, in essence, shape the organization as well. Building an organizational culture that is based on terminal and instrumental values in vital in nonprofit sustainability for it is the values that act as the fuel for the rocket! Equally important, when creating a nonprofit organization, strategic planning is an essential step with sustainable benefits. As such, the second of the six keys of nonprofit sustainability is community resource mapping. Community resource mapping is a process by which data is collected in order to create a map of community assets and resources, such as people, physical structures, organizations and institutions, within a defined area, and it can be utilized to create a meaningful service project. As a nonprofit leader, knowing what businesses and/or organizations within a particular ‘service area’ offer similar or the same products, programs, and services is detrimental to the sustainability of nonprofit organizations. Additionally, knowing what resources are available, what resources are needed, and what organizations are contributing to and/or providing those resources alleviates the pitfall of a saturation of services, products, and/or programs in a given community which can easily translate into a loss of potential volunteers, donors, funding and ultimately the demise of an organization. Community resource mapping is a continuous process, leaders should conduct internet searches for nonprofits within their specific area as well as community (county) tours to ensure that the organization is providing needed resources within community. Both interval and continuous community resource mapping are vital to nonprofit sustainability. The third of the six keys of nonprofit sustainability is the creation of the VMOSA (Vision, Mission, Objectives, Strategies, and Action Plans). VMOSA is a practical planning process utilized to help community groups define a vision and develop practical ways to enact change within the community; in essence creating an organizational culture. VMOSA planning is vital because it becomes instrumental in helping nonprofit organizations set and achieve short-term goals while keeping sight of their long-term vision. VMOSA implemented into the planning process focuses the group’s efforts of creating an organizational culture by developing and supporting a clear mission, building consensus, and grounding the group’s dreams. The vision statement is the hopes, dreams, and aspirations of an organization; what it will like to accomplish or achieve. As Peter Senge (1990) explains it in The Fifth Discipline, “Purpose is similar to a direction, a general heading. Vision is a specific destination, a picture in your head of a desired future. Purpose is abstract. Vision is concrete.” The mission statement is the ‘how’ of an organization, it defines the company’s goals, ethics, culture, and norms for decision-making. The Objectives are the measurable outcomes that the nonprofit want to achieve; these are put into place primarily for management to gauge the effectiveness of the organization. Strategies and action plans, are self-explanatory and will vary based upon the outcomes that are put in place through the vision, mission and objectives. VMOSAs can be altered as milestones are reached or needs for resources, services and programs change. The ability to reframe VMOSAs to meet changing needs are vital to nonprofit sustainability. The fourth of the six keys of nonprofit sustainability is organizational alignment, hiring employees, selecting volunteers and board members who share the same mission, vision, and goals of the nonprofit organization. In addition to the founder, an important key in organizational alignment are individuals (employees, volunteers, and board members) who are self-actualizing (self-transcendent, self-aware) because these individuals know who they are and have accepted themselves as persons, resulting in freedom from the crippling need for approval and from the fear of expressing their true selves. Consequently, these individuals are able to be authentic, reflecting on their core values, identity, emotions, motives, and goals and are aware of and trust their own feelings. Organizational alignment is an ongoing process of building cohesion and connections which strengthen the organizational culture. The vitality of a nonprofit organization is dependent upon employee and volunteer commitment to the mission and vision of the organization because it is their efforts that will ultimately determine success or failure. Ken Hultman (2016) espouses that, organizational alignment, is achieved when organization’s mission and vision overlap with the purpose (personal mission), dreams (personal vision) and goals of the employees and volunteers. Nonprofit sustainability can be anchored upon the volunteers, employees, board members, etc. who desire to become a part of something that they believe in and can be committed to. Health—the $29.81 billion estimated for 2015 giving to this category was 1.3 percent higher, in current dollars than the 2014 estimate. Public-Society Benefit—the $26.95 billion estimate for 2015 increased 6.0 percent in current dollars over 2014. Arts/Culture/Humanities—at an estimated $17.07 billion, growth in current dollars was 7.0 percent in 2015.
International Affairs—the $15.75 billion estimate for 2015 increased 17.5 percent, in current dollars, from 2014. 21% came from contributions, gifts and government grants. 72% came from program service revenues, which include government fees and contracts. Knowing the donor(s) and how donations are allocated assists greatly in creating and implementing a fundraising plan, both are vital to the sustainability of nonprofit organizations. By the same token, creating a web presence (organizational website) can make all the difference when it comes to donors, which is why this is the sixth of the six keys to nonprofit organization sustainability. The Charitable Giving Report reported a 9.2% increase in online fundraising in 2015 and shows that 7.1% of overall fundraising is the result of online giving. Having a web presence creates the ability to have potential donors and volunteers interact with the organization online. Many of the donors may never physically connect with the nonprofit organization, many volunteers conduct internet searches to find volunteer opportunities, and many businesses and organizations want to see the ‘fruits of labor’ before becoming involved with a nonprofit organization. A professional organizational website can create the medium for these interactions and promote retention. The Online Fundraising Scorecard reports that 44% of nonprofits who receive information send emails within 90 days of website sign-up, yet 37% fail to send an email within 30 days are sign-up. From this information, it can be ascertained that a web presence can create additional avenues to reach the public. Web presence leads to retention as well. The median retention rate for online donors is 25% for the first-year and 62% for multi-year. In the long run, the strategic planning of a nonprofit organization from its creation supports sustainability. As Founders, those personal values will be foundational in creating an organizational culture that holds human values and trust as fundamental values. Although not a requirement, those who found a nonprofit organization need to have mastered self-actualizations (self-transcendence, self-awareness) as the call to the nonprofit sector is not for the faint of heart; it requires a dedication, commitment, and eagle-eye focus that can see the vision in the midst of seemingly nothingness. Holding fast to the six keys for sustainability: values as organizational culture, community resource mapping, VMOSA, organizational alignment, understanding donors and how the donations are allocated, and creating a web presence are paramount to the success or failure of nonprofit organizations. Strategic planning is an ongoing process (not a one-time event) and as such adjusting and realigning nonprofit organizations to reflect the changes in society, public and private sector is going to determine its sustainability. Additionally, web presence and retention are also paramount to nonprofit sustainability, as such nonprofit organizations will benefit from creating an organizational website, that is optimized for mobile viewing, one-click donation capability, and contains a place for potential donors and volunteers to sign-up for updates on all organization events. Creating and founding a nonprofit organization need not be a fearful or burdensome task. On the contrary, it can be one of the most fulfilling endeavors one will undertake. The humility that comes from knowing that you have a vision that will impact this world for the better can not only impact and empower the individuals who will utilize your services, it can serve as inspiration for the founder, volunteers, and donors as well. Hultman, K. (2002). Balancing Individual and Organizational Values: Walking the Tightrope to Success. New York: John Wiley & Sons, Inc.
Northouse, P. G. (2016). Leadership Theory and Practice. Seventh Edition. Thousand Oaks: Sage Publications, Inc.
Schein, E. H. (2010). Organizational Culture and Leadership Fourth Edition. San Francisco: Jossey-Bass. Senge, P. M. (2006). The Fifth Discipline. The Art and Practice of the Learning Organization. New York: Doubleday. Weerawardena, J., McDonald, R. E., & Mort, G. S. (2010). Sustainability of Nonprofit Organizations: An Empirical Investigation. Journal of World Business Vol. 45, 346-356. Ken Hultman. (2002) Balancing Individual and Organizational Values. Massachusetts: Jossey-Bass, Inc.
 Peter Senge. (2006) The Fifth Dimension. The Art and Practice of the Learning Organization. New York: Doubleday. Peter Northouse. (2016) Leadership Theory and Practice 7th Edition. Thousand Oaks: Sage Publications, Inc.